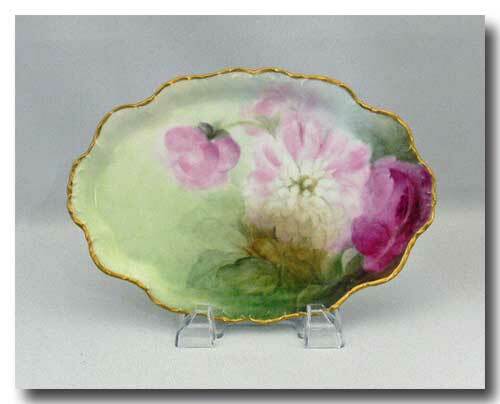 THIS IS A LOVELY LIMOGES FRENCH HAND PAINTED OVAL PORCELAIN VANITY TRAY FROM CHARLES AHRENFELDT, FOUNDED IN 1894. THEY MADE UTILITY WARE OF ALL KINDS, ALSO TABLEWARE AND ARTISTIC PORCELAIN. AHRENFELDT WAS FIRST AND FOREMOST A DEALER AND EXPORTER WHO TOOK CARE OF EXPORT FOR MANY SMALL DECORATING STUDIOS. THERE IS NO EVIDENCE OF A PORCELAIN FACTORY. THE TRAY IS IN EXCELLENT CONDITION WITH NO CRACK CRAZING OR CHIPS. APPROX. 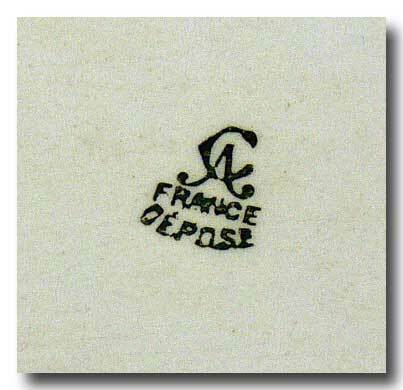 SIZE: 9 ½ INCHES L. X 6 ¾ INCHES W.